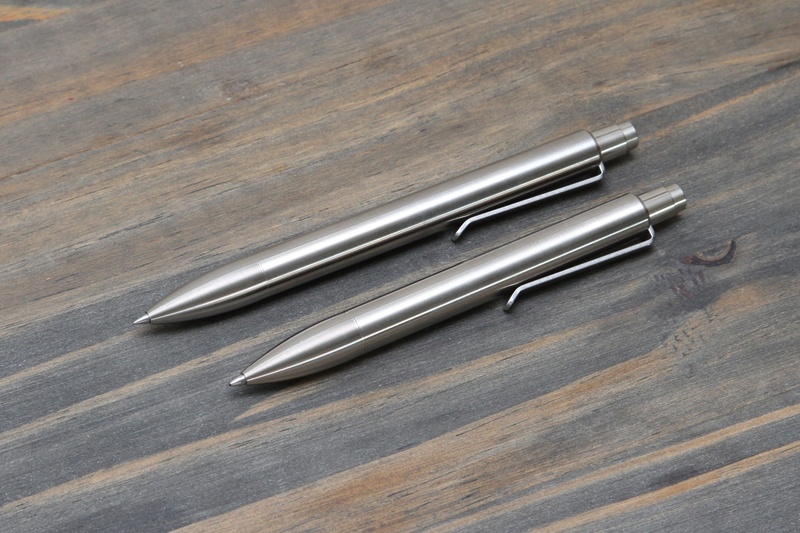 Description: A precision machined pen with a unique lay pattern grip from the people that brought you the orginal aluminum Tactile Turn Mover and Shaker. It’s no secret that I was a huge fan of the original Tactile Turn Mover and Shaker in aluminum. I was a backer of the project, and I had three in my possession until Will got in touch and told me he was making them in new materials. Well, here they are! My favorite alternative to a fountain pen has been either the Mover or Shaker since I had got my hands on the original prototypes. I didn’t think it was possible, but they’ve gotten better. Tactile Turn is launching a new Kickstarter campaign for the new materials – brass, bronze, titanium and copper – make sure you head over and check it out if you like what you see! Also be sure to check out my original review of the Mover and Shaker here. Fit and finish are still great. I showed a brass Shaker to my coworker and he didn’t know how to take it apart. 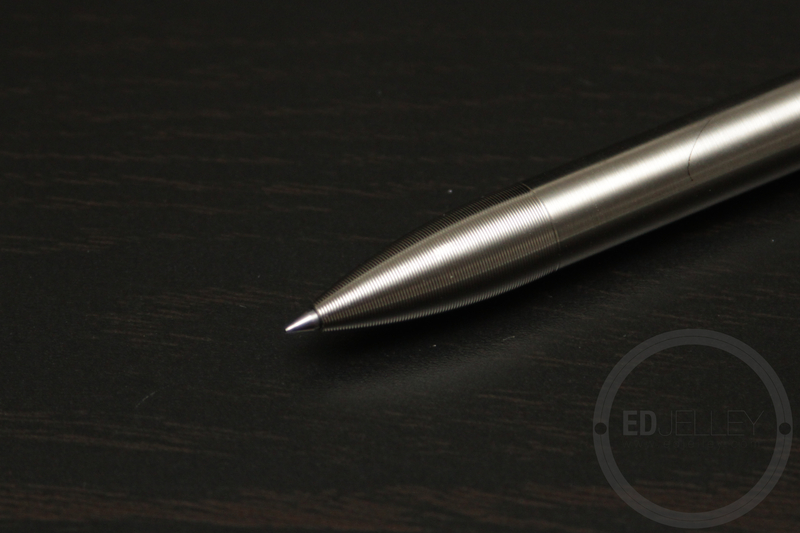 The seam in the middle of the pen is virtually invisible until you need to unscrew the barrel to change out refills. Both the Mover and Shaker feel great in hand, but I prefer the slightly longer Mover. The clips are smooth and have some nice grip without being too stiff. The custom lay pattern grip is what really makes the pen shine though. More on that in the feel section. Brass: My favorite. It looks beautiful and has a great substantial feel in hand. There’s no need to press down whatsoever to get the G2 or Schmidt EasyFlow 9000 working. It’s the second heaviest material but still feels great. The lay pattern isn’t as sharp as the titanium, but it still provides great grip. 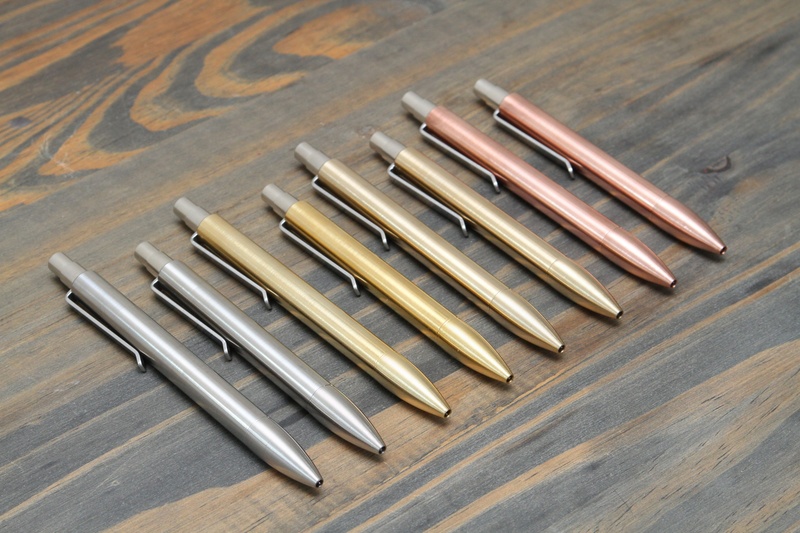 Copper: The heaviest of the bunch, this raw copper pen takes on a life of it’s own. 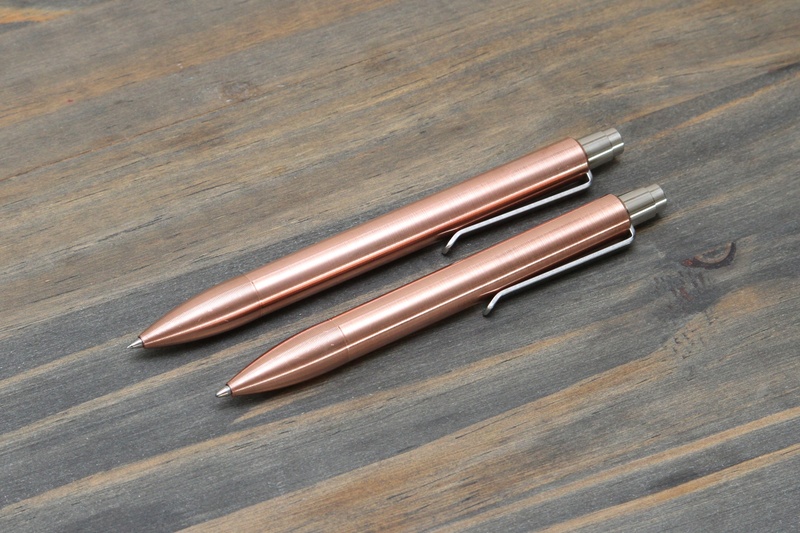 After a few weeks of use, the copper will darken and patina – giving a great vintage look and feel. I happen to like how it looks, but those who always need something clean and shiny may want to check out the other materials. Bronze: The bronze is similar to the brass, but has a reddish undertone to it. It looks and feels similar to the brass, but it will not patina. According to the Kickstarter page, it will maintain it’s brilliance and shine for a long time without polishing. I’m excited to carry this one around and see how it compares to the aging brass. Titanium: Not only does it sound badass – it kind of is. 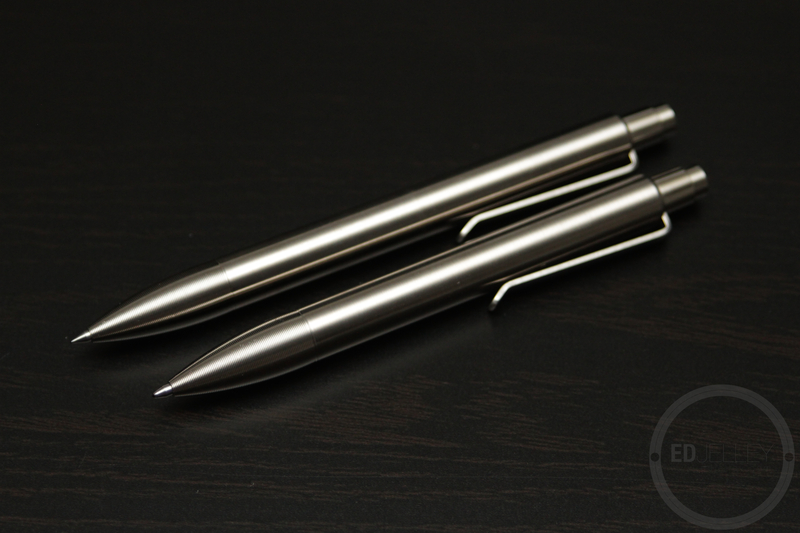 People love titanium for its signature dull grey hue and amazing strength to weight ratio. The grip on this material has a bit more “bite” than the others. It’s lighter weight and looks great. I prefer the brass and bronze, but this one is by no means a dud. The original prototype came with a Fisher Space Pen refill, but thanks to Mike Dudek over at ClickyPost.com, the Tactile Turn Shaker is now shipping with the buttery smooth Schmidt EasyFlow 9000. 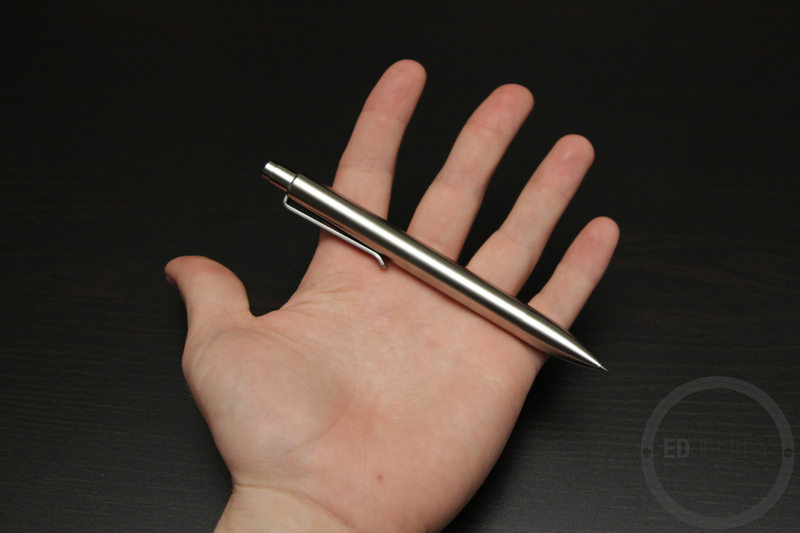 It really makes me want to keep writing with a ballpoint…it’s that good. The Mover takes a standard Pilot G2 refill which also works quite well. I like the clean precise lines, but the 0.38 is a tad bit scratchy. 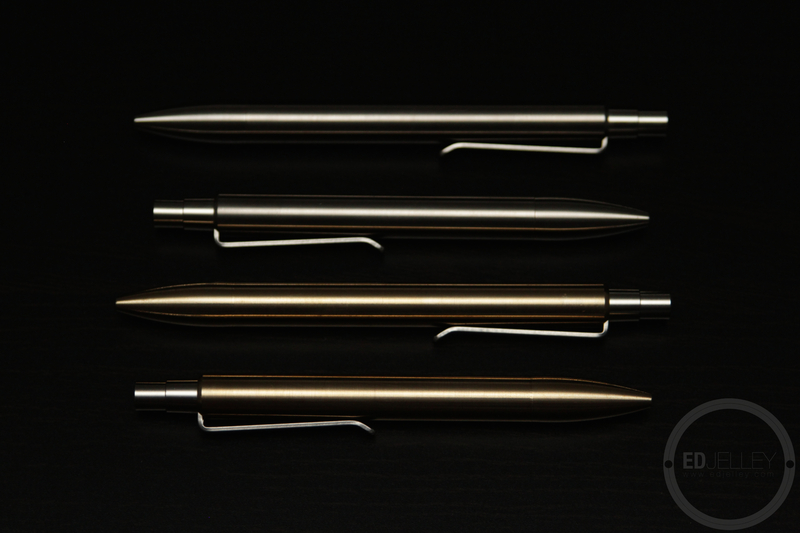 There are tons of different Parker-style refills out there and others can be hacked to fit a G2. If you’re not a fan of the refills that ship with the pen, I’m sure you can find something out there you like! 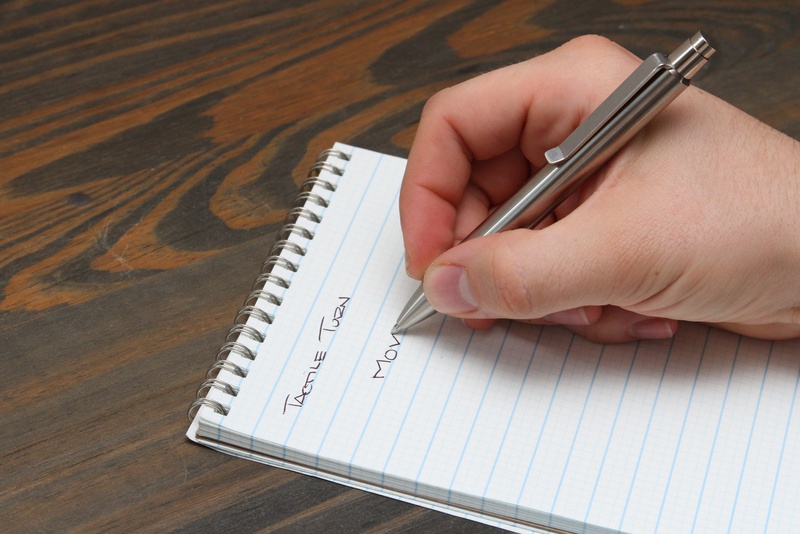 Pen refills STILL confuse me – be sure to do your homework before buying refills if you don’t like the ones that are included. I’ve been using the Tactile Turn Mover and Shaker since I received my backing, and I really do love it. There’s a really good chance I have one in my pocket at all times. These new materials only make me want more of them. Backer rewards start at $45 for the classic aluminum and have tons of options and packages for all of the other materials. Head on over to the Tactile Turn Kickstarter to pick one up today. Disclaimer: These pens were given to me by Tactile Turn for review. I also shot the photos for the Kickstarter campaign. They were used with permission on both ends. All opinions are my own!  Announcements / Guest Posts / Upcoming Reviews! Those look great! I have 2 of the aluminum Movers in burgundy and black, and am tempted by the Copper one. 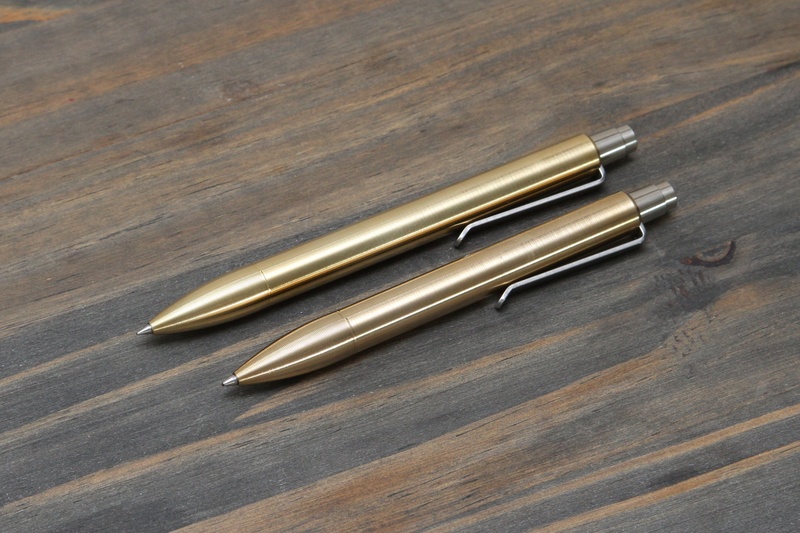 Do you find any real differences in construction between the first run and these new pens? He uses the word “refined” and I did not know if that referred to higher end materials or a refined manufacturing technique. Man, these are really sharp! Almost makes me feel bad that I’m using fountain pens exclusively.